Mediavine's exclusive IAB-approved, GDPR-compliant Consent Solution is available to Mediavine publishers now. With our exclusive IAB-framework-based solution, your Consent Management Platform is fully integrated with your Mediavine ads. The CMP (Consent Management Platform) is a consent pop-up that will show to your EU traffic, allowing them to opt in or out of data collection in an easy-to-read, easy-to-use, customizable platform. If your reader opts in, they'll be shown personalized ads just like normal. If your reader opts out, they'll be shown only non-personalized ads. This isn't ideal, because non-personalized ads have far lower CPMs than personalized ads. 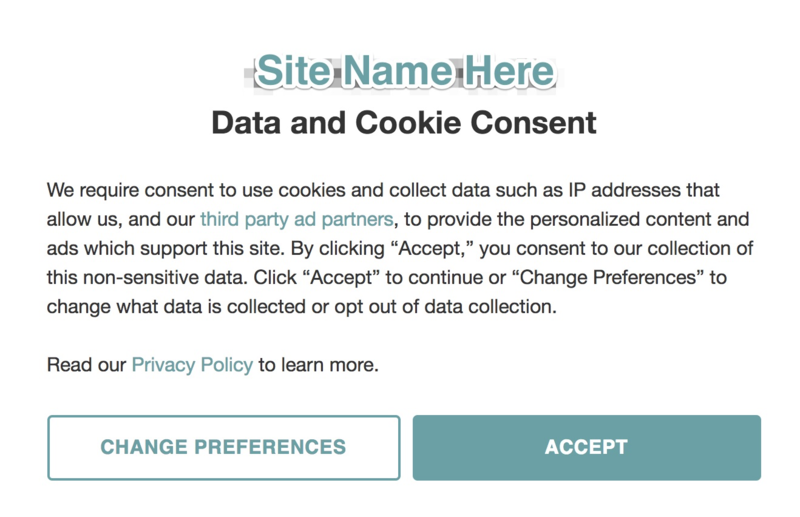 If a reader that has opted out changes their mind and wants to opt in, they can change their preferences in the "Change Privacy Settings" link in the footer of the site. Down the road we will have an option to include a "reminder" pop-up to the user, but that isn't available quite yet. Preliminary testing on The Hollywood Gossip is seeing upwards of 95% consent rates, ensuring that your digital advertising revenue from users in the EU remains intact. Each site will be unique, but we are very hopeful that this trend will continue across all of Mediavine's partner sites. To turn on the Mediavine CMP, please visit your Mediavine Dashboard Settings area, and click on the "Privacy" tab. This option will show all of your EU readers non-personalized ads, which earn much less than personalized ads. If you have significant EU readership, you will likely see revenue decreases if you choose this option. This will activate the popup in the screenshots above. Your readers in the EU will have the choice to opt in or out of your personalized ads, and any additional consents you include. Choose one of those options, and add any additional custom consents that you may need. If you are using our CMP, you can add your own custom consents to it for the other data collection services you utilize, right in your Mediavine Dashboard in the Privacy tab. Just click that "Add Consent" button, and you'll be able to input additional text into the form. At this time it is not possible to customize the main text in the pop-up, however that feature is on our roadmap for a future release. The consent will show once per EU visitor, and is good for up to 13 months, unless any of the following happens. If those items happen, it will show the popup again to get an updated consent. If you're curious and would like to run a test, we recommend using a VPN to emulate browsing in from a country in Europe. If you're unsure about what a VPN even is, don't worry! Just reach out to publishers@mediavine.com and one of our support specialists will be happy to run a test for you! Utilizing the Mediavine CMP will ensure that the display advertising portion of your GDPR requirements are compliant with this new law, but this is likely NOT all you need to do to be fully compliant. The Mediavine CMP allows you to add additional consents into the platform for a streamlined experience for your users. Which other consents you will need, and how those should be worded is not something that we are able to advise on. For real. But please make sure that things like affiliate links, your email marketing services, sponsored campaign tracking pixels, giveaways, and ANYTHING on your site that collects data about your readers has been looked at and taken care of. Please contact a lawyer for specific recommendations on becoming fully GDPR-compliant. Each site and situation is unique, and we cannot give legal advice.